CMS Window Systems has been contracted to manufacture and install Kawneer curtain walling for a new Dumfries & Galloway NHS Hospital. 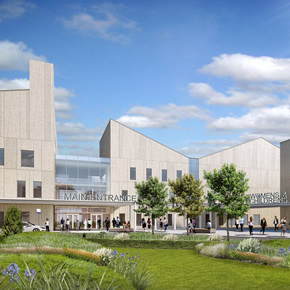 Designed by Ryder Architecture, the district hospital is being developed by the High Wood Health organisation, in association with NHS Dumfries and Galloway. It will accommodate an emergency care department and a collective theatre multiplex for day surgery, endoscopy and surgical patients. The hospital will also provide consolidated ambulatory care, additional staff residencies and a heli-pad. It is scheduled for completion in 2017. CMS Window Systems has been appointed by the project’s contractor, Laing O’Rourke, to fabricate Kawneer AA100 curtain walling for the hospital’s main building, as well as its three annexes. In addition to this, the building will feature Kawneer AA720 system doors and a combination of casement and pivot windows. The aluminium systems will be coalesced with sealed units, manufactured by GLASSOLUTIONS, to enhance solar control, as well as thermal and acoustic insulation. To promote greater confidentiality within hospitals, CMS will also fit around 500 sealed units featuring integral Pellini interstitial blinds, supplied by Morley Glass & Glazing. The integrated solution will allow the hospital’s patients some privacy, whilst ensuring adequate cleanliness and sanitation.